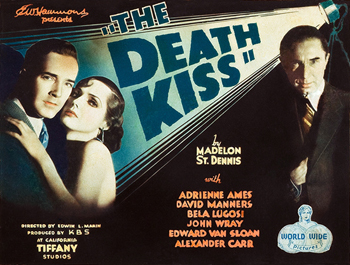 The Death Kiss is a neat programmer from 1932 that re-unites three of the stars of Dracula in a Hollywood movie-set murder mystery. DM receives top billing and stars as Franklyn Drew, a screenwriter with a nose for detective work. Obviously banking on Lugosi's name alone, the film presents him in a red-herring role. But, with that marvelously expressive face and that intoxicating voice, who could suspect anyone else when Bela's around? Another fascinating element of The Death Kiss is its' glimpse into the world of early 1930's Hollywood filmmaking from a behind the scenes point of view. The use of color tints is also experimented with here to nice effect. Noticeable, too, is the film's pre-code sensibility. I love The Death Kiss. I first saw it in 1979 and it was the first time (besides Mark of the Vampire with its gag ending) that I ever saw a film that Bela lived through! DM does a great job of carrying the picture and his calm, dignified presence is ever-present. Handsome as always and a little more outspoken than usual, this is one of my favorite DM roles. He matches up very well with his leading lady, the beautiful Adrienne Ames, who died tragically in 1947. When I first saw The Death Kiss, I hastened to call DM and tell him how cool I thought it was. After all, at the end of the film, he and Bela are chatting pals! His response: "That was one of the things I did strictly for the cash and promptly forgot." Oh well! Purchase The Death Kiss in DVD or Blu-ray format through these Amazon.com links and a portion of the sale goes to the David Manners web site. Help support this site with your purchase.